Tenor John Garst returns to the familiar settings of UCA, where he enjoyed teaching in 2016 – 2017. During this last school year he was in Lake Charles, Louisiana at McNeese State University teaching Voice, Opera Workshop, Vocal Diction, and Vocal Pedagogy. Masters and Bachelor degrees are from the University of Arkansas. His performances and include numerous operatic roles, including Radames, Don Jose, Cavardossi, Duke of Mantua, Canio, Tamino, Calaf, Alfredo, Belmonte, Max, Froh, and Camille de Rosillion. He has been seen at the Florida Grand Opera, Des Moines Metro Opera, Hungarian State Opera, Darmstadt State Opera, Kaiserslautern Opera, and Theater Nodrhausen, among many others. Mr. Garst sang the World Premier of Lori Laitman’s opera, The Scarlet Letter, where he tackled the challenging role of Reverend Dimmsdale, to rousing critical success. 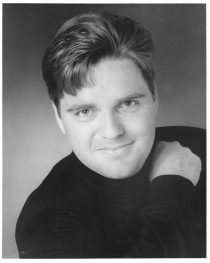 While in Germany, in 2001, this tenor performed for the opening of the German Chancellor’s Office in Berlin. Concert performances include Beethoven’s Ninth Symphony, Ramirez’ Misa Criolla, and Martin’s In Terra Pax. At UCA, he has also been heard as solosist for Mahler’s Das Lied von der Erde. His performance of Schubert’s song cycle, Die schöne Műllerin, was a highlight during his doctoral studies at UNT, which was repeated for UCA.